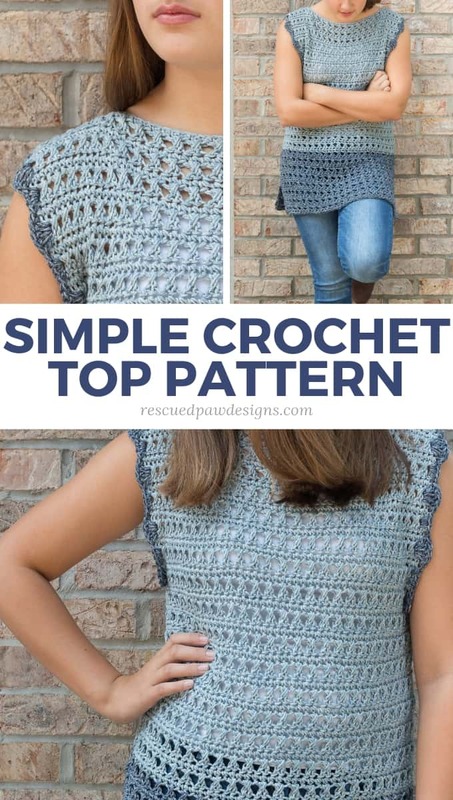 Looking for an easy crochet top pattern? 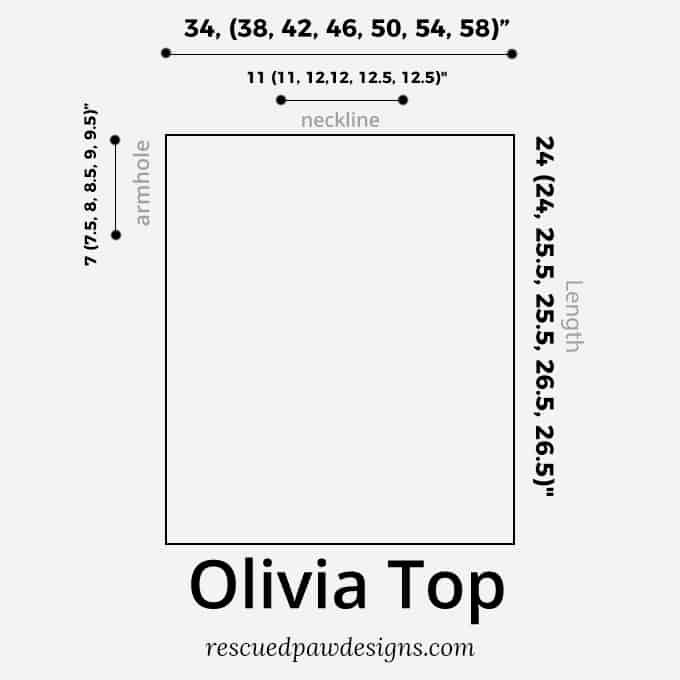 The Olivia sweater top is a simple 2 panel design that works up fast! 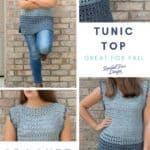 Read on down to learn how to crochet a top today! 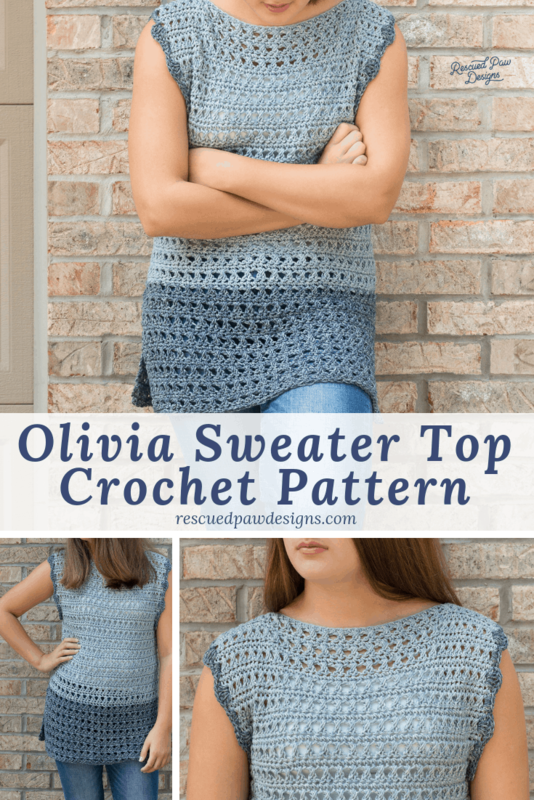 The Olivia crochet top is a basic 2 rectangle design which makes it a great pattern for those wanting to try a crochet garment! 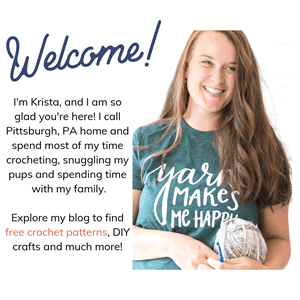 And I promise with the free pattern below you can learn how to crochet a sweater top in no time at all! 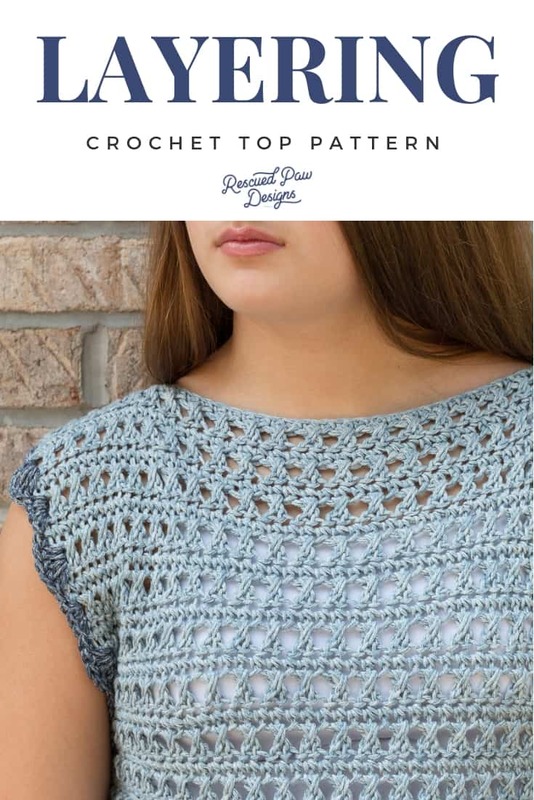 This crochet pattern top is special! This pattern is special to me because it is officially my first ever crochet top design! I am so proud of this piece and the hours it took to figure out sizing, yardage and photographing it! I am so so happy and proud to share this crochet sweater top with you! I hope you like it and please let me know if you do decide to make it! 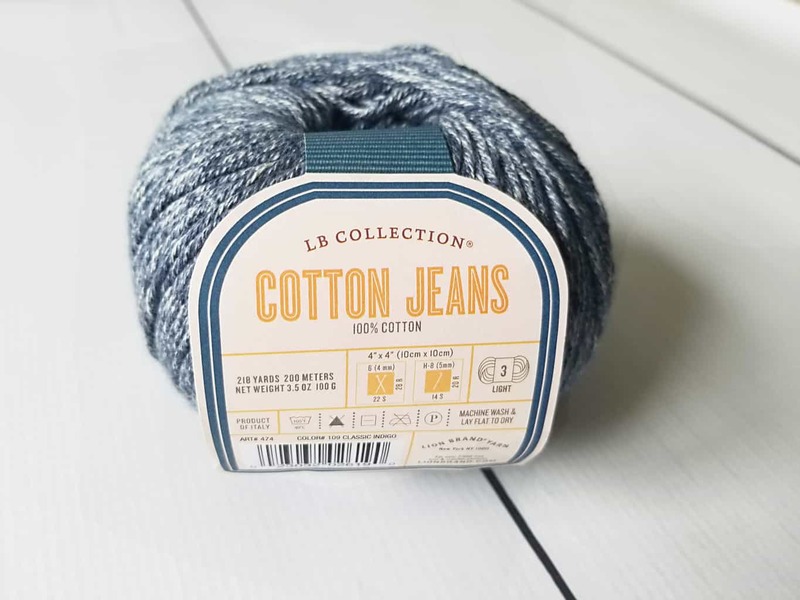 For the entire design you will be using the Lion Brand Jeans Cotton which is just an amazing extension of their Jeans acrylic yarn line! 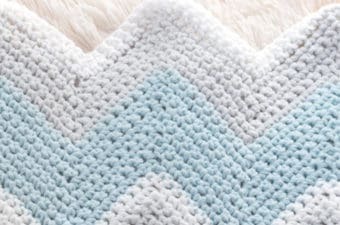 It is a DK light weight yarn but is amazingly soft and works up beautifully in sweaters, baby blankets and even for a comfy summer throw! 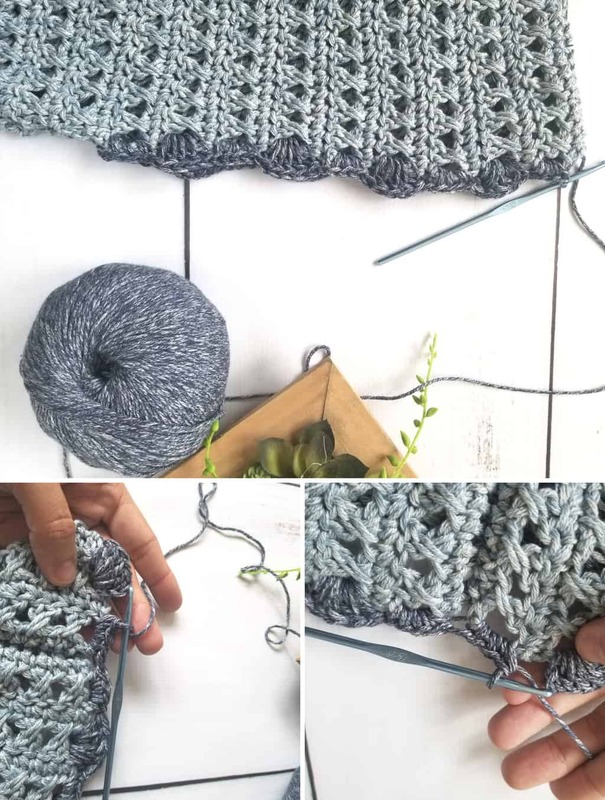 You will need two colors of this yummy yarn (or even one if you prefer less ends to weave in) and then you are good to go! Check it out below! The Drape is Perfect for a Top! 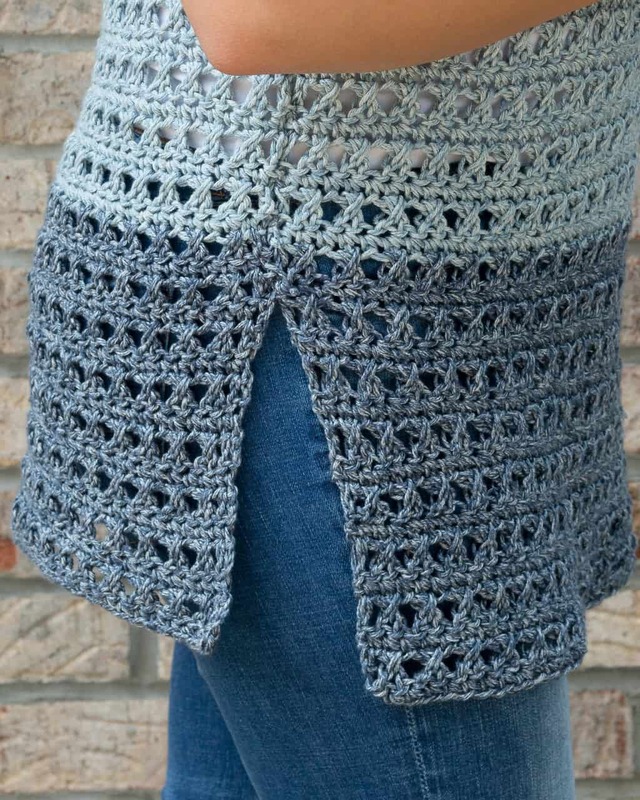 Another thing you will love about this yarn is the drape! It needs little to no shaping and lays beautifully when worn! Easy to Construct Crochet Top! This piece uses just TWO basic rectangles and is super easy to put together! You will need to know how to do the mattress stitch & a slip stitch to finish. That’s it! 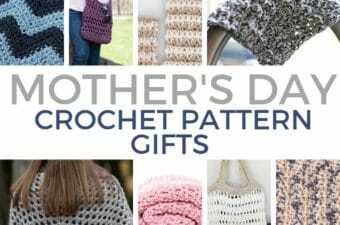 If you are ready to get started scroll on down for the free pattern or purchase an inexpensive PDF version for only $2.99 below. Description: You will love how easy this lightweight top feels when worn. The soft drape and the way it wears will have you going back to this piece time and time again! Color: Sun Bleached & Classic Indigo if doing the color blocked look or just one color of choice from the LB Collection Jeans Cotton Yarn Line. 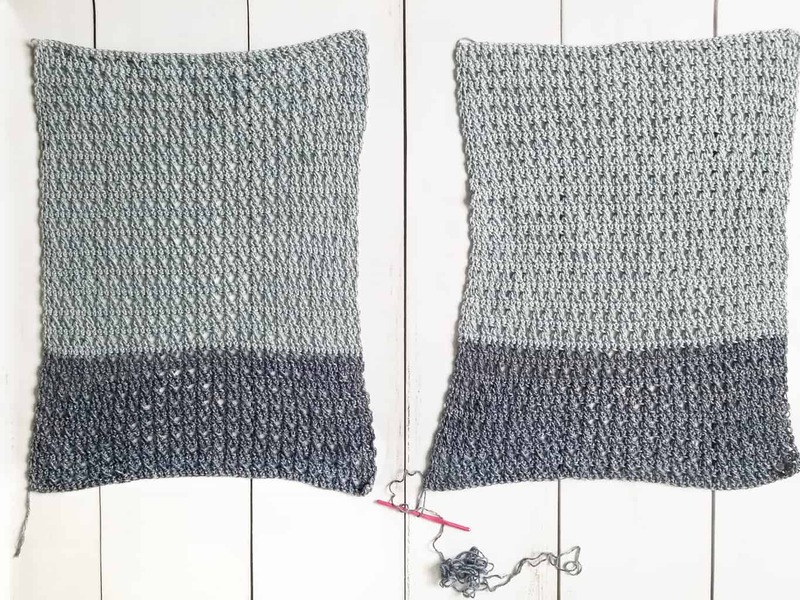 I changed my color on row 34 but this is totally optional and you can change colors on any row or even make stripes! If you are between sizes, please size up. To follow pattern more easily, highlight all numbers for your size before beginning. Sides: With the wrong side of the front & back panel facing, start at the bottom of the garment and sew the side seam (use the mattress stitch) until the inches shown below are left according to the size made. If you would like more room at the hips leave 3-4″ slit (un-seamed) at the bottom, on each side of body. Shoulders: Before you work the seams ( I recommend a slip stitch seam) across the top of the shoulders, try on the garment and mark off how wide you want your neckline to be. *Use the 3.75 mm hook for this part of the top. (optional) I suggest using a contrasting color but any color would work fine. Working along the sleeve opening work 4 sc’s in the side of the first dc row, in the next dc row work 5 double crochets along the side, repeat this process around the sleeve opening, finishing with a sl st to the first set of 4 sc’s. One Last Step: Weave in the ends throughout the piece with a yarn needle and you are done! Hi the pattern is beautiful. I have one question, if you are using both colors how many skeins of each color? Hi Krista! 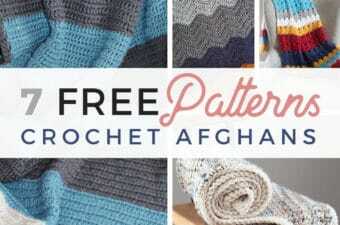 I too love this pattern and can’t wait to make it! I am wondering how many skeins of each color? Thank you! by the way I was born and raised in Pittsburgh but now live in North Carolina. :). Hi! It would all depend on the size you are making. I figured out an overall yardage but left the color blocking width to the crocheter so every one made is unique. Hope that helps! Ok, gotcha! One other question. Is there another yarn that will work well for this pattern other than Jeans??? Thank you! Hi! I think the new comfy cotton blend would be great with this pattern too or Heartland yarn would even work great too! Hi! It’s a great pattern, what’s your suggestion about adding a small sleeve. Thank you.